The Hours - My Memoir: Soak No More! that has seen no takers. thus he calls out loud. says he, with a grin. at all the happy faces. but joy hides in the trivial! 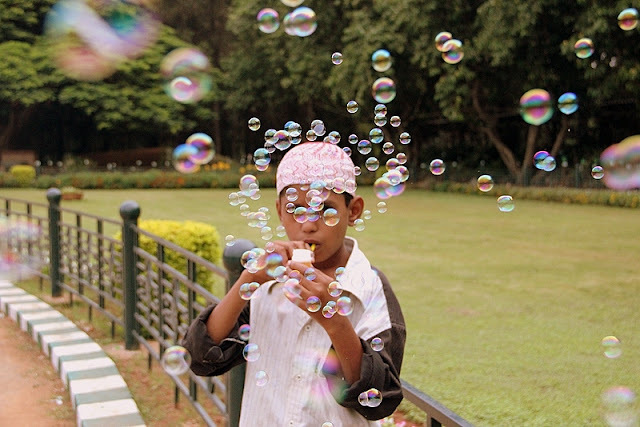 PS: About the picture - I met this little boy who sells bubble makers at Lalbagh who was eager to empty the solution until i captured my best shot. In return I promise to give him some prints. Ahaha, read it twice. Two angles to look a bubbles. I guess I will just believe the lies. Wonderful click and very timely! Marvelous! Very well written and a great picture to go with it. And shot was very timely. 'dreams into reality, they shall spin' loved it. Very optimistic. great one Ajeya... i loved the last line the most. Thanks Confused Soul. Welcome to my blog and thanks for promoting. It is amazing what contests can do to you! Thanks Indrani. :-) However, this is my 39th poem so far.But you are right. I returned back to poetry after almost an year now. thanks to the contest i guess. Welcome and Thank You Prashanth for stopping by. Sure next time! An award for you. Please visit here. lovely, loved the fourth one! A person essentially help to make seriously articles I might state. That is the very first time I frequented your web page and to this point? I surprised with the research you made to make this actual publish amazing. Fantastic job! This is such a cool shot! Well done. Thanks for writing this, read something short and unpretentious after a long time.